My most recent passion has been to make my own candles! And it's super easy, once you've got the necessary materials. Personally, I love to use wax from old candles, which I sort colour to get a clean result. 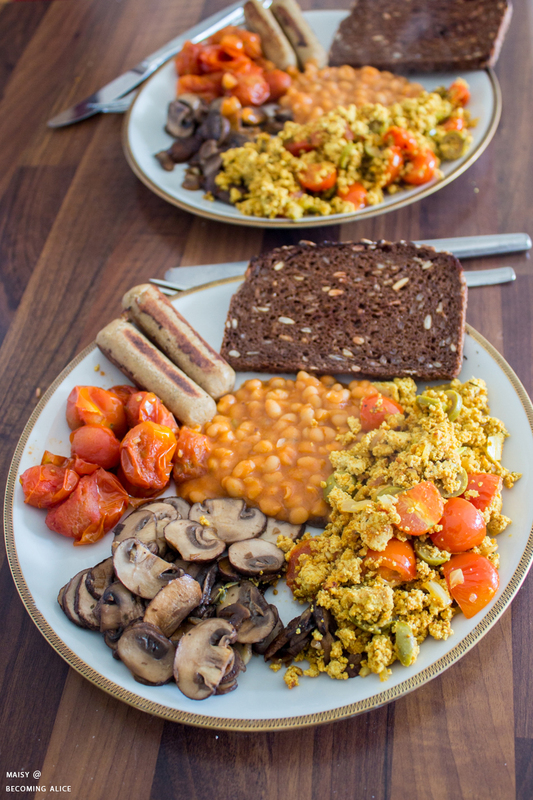 Zero waste for the win! 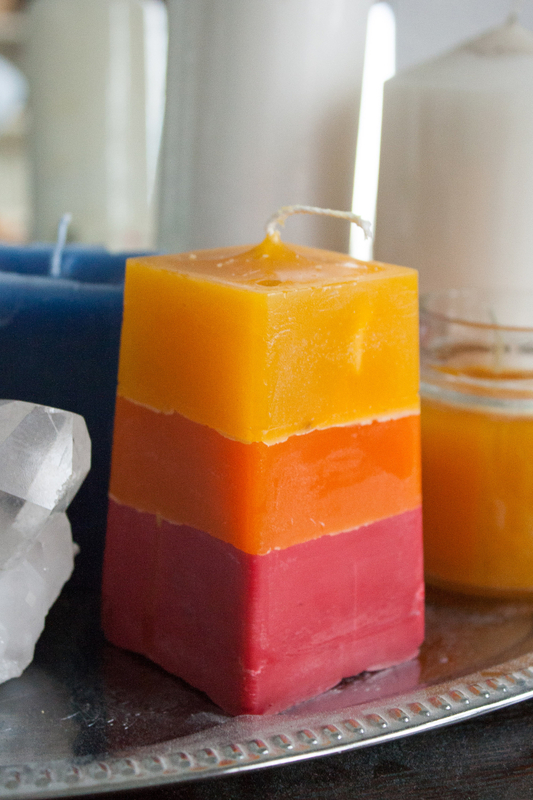 Start by choosing the colours and scents you want to go with for your candles. For example, I chose lavender essential oil for a dark blue candle, and vanilla for a white candle. There are endless possibilities: plain, single-coloured, multi-coloured, scented, unscented, pillar shaped, pyramid shaped, votive candles, tea lights and whatnot. Also decide which method you are going to use for your candles: are you going to fill the wax into a candle mold to make a pillar candle, or into a glass jar where the container will be part of the decoration? 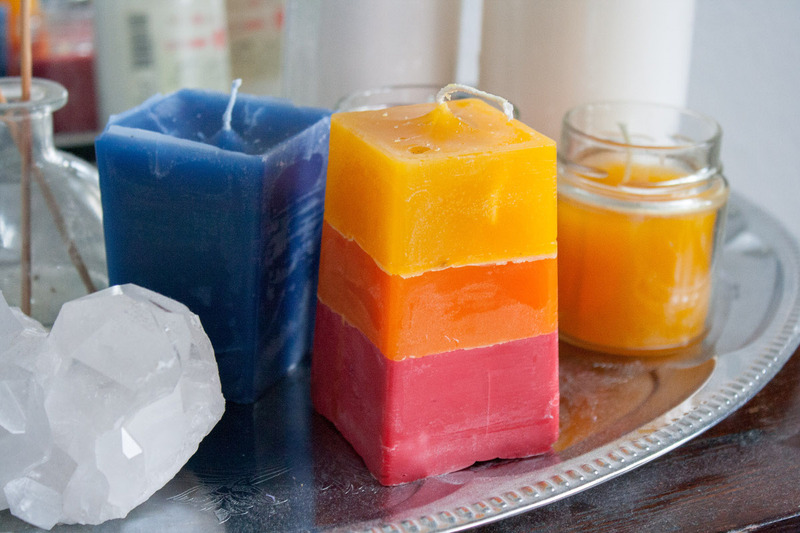 If you are going for a multi-coloured candle, plan in which order you need to melt the different types of wax to create layers. 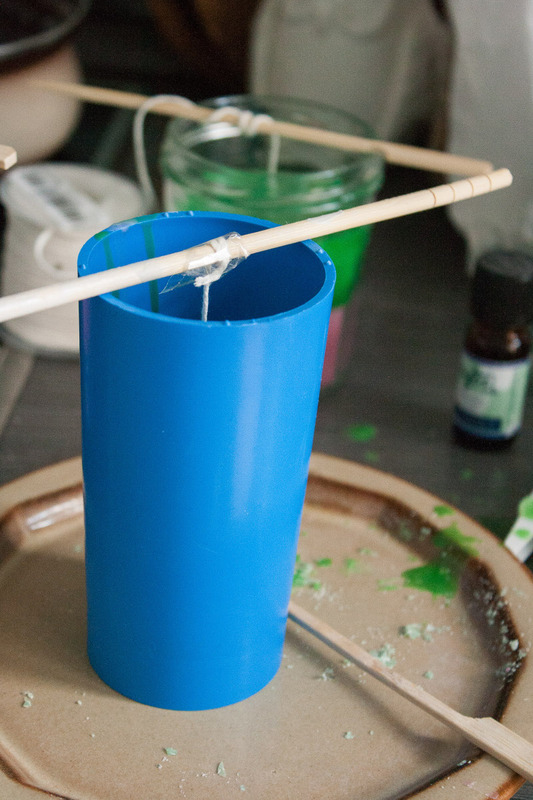 Prepare your containers by taping or gluing the wick to the bottom of the jar. Prop up the wick using wood skewers or tooth picks. As you can see on the picture above, I usually tie the wick into a knot and secure it with a piece of tape to prevent it from sinking into the hot wax later. 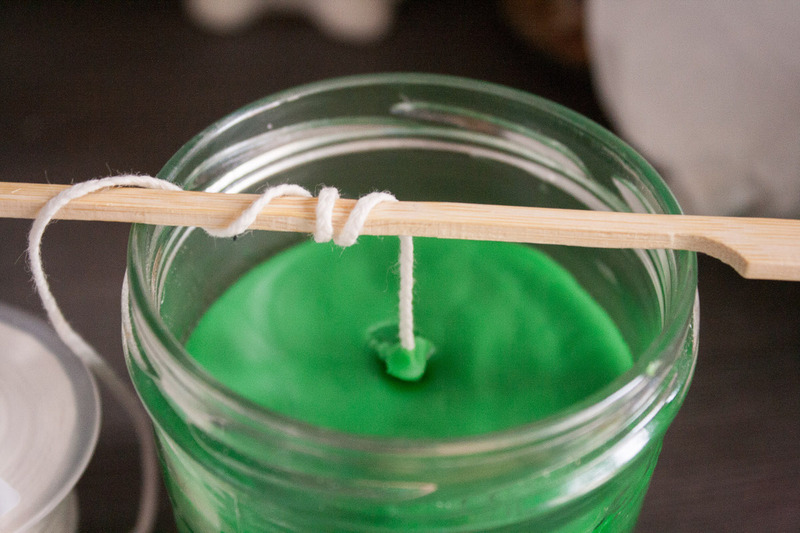 To prevent any air bubbles from forming inside the candle (especially around the wick), use a wooden skewer to poke down into the candle when the wax is still soft to release any air. 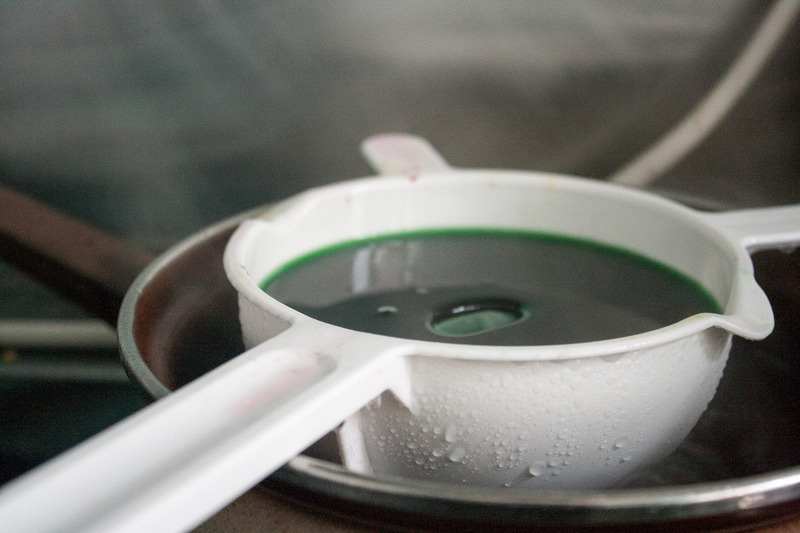 To heat up the wax I add about 2 inches of water into a medium sized cooking pot (I used one that I don't use for cooking anymore, but just for DIY projects such as candles, sugaring wax or other homemade body care products) and bring that to a boil. I then center a smaller pot in the one with the boiling water, creating a double boiler. 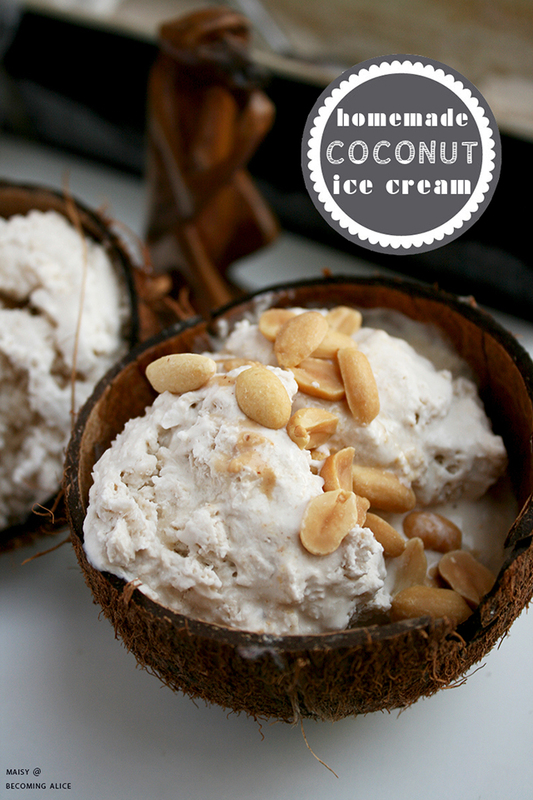 You can also use an empty tin can (be careful - this gets very hot! ), or get yourself a handy pouring pot such as this one that will make the pouring process less messy. Place your wax (e.g. from old candles) into the smaller container. Also add your pigment dyes if using. 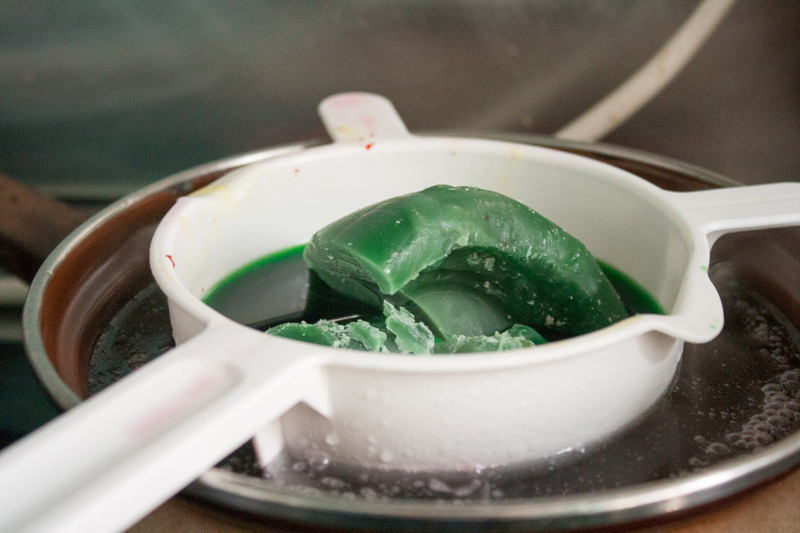 Lower the heat to medium and let the wax slowly melt to liquid, as seen above. 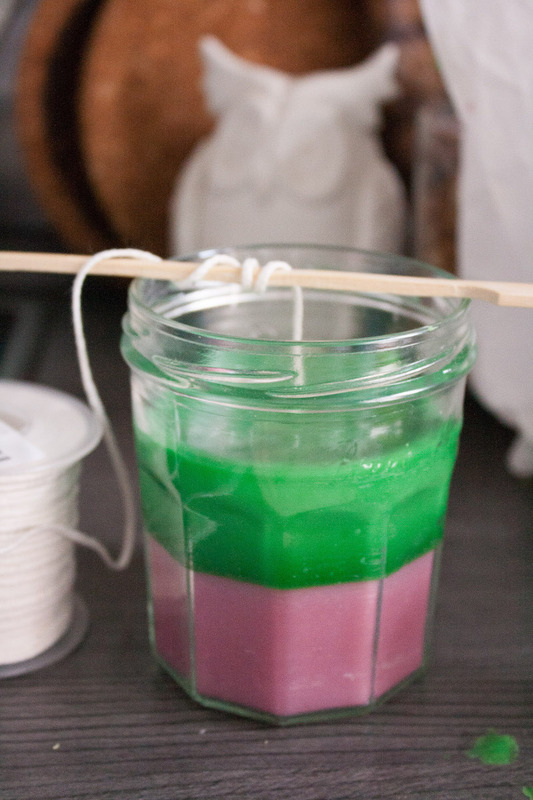 To make a scented candle, add your fragrances to the melted mixture. 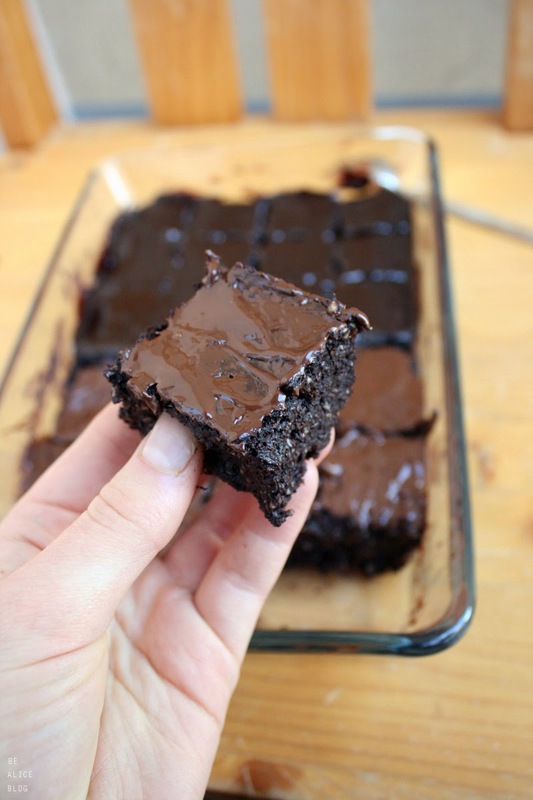 Cover your work surface with newspaper or tin foil in case of drips or spills. 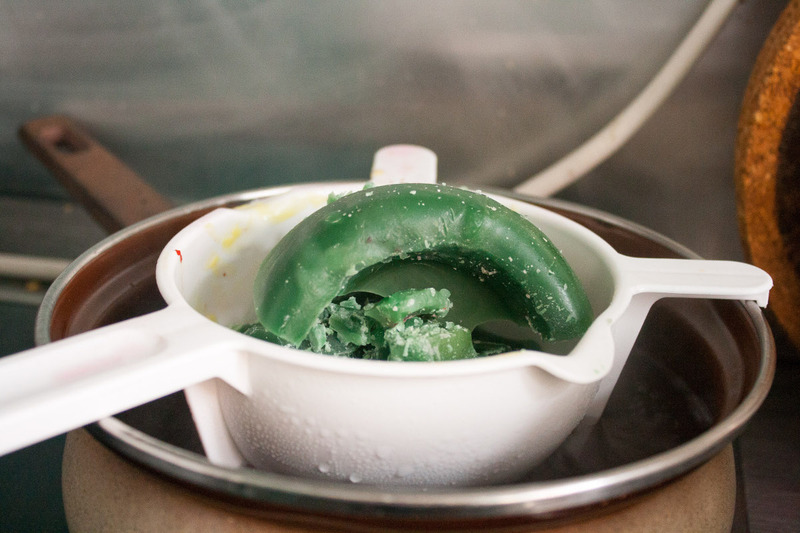 Then slowly pour the melted wax into your mold or container until it's almost full. Leave a small amount of wax to top off the candle once set. Be sure to also cover the wick with wax (unless it's already waxed), otherwise the candle won't burn properly. 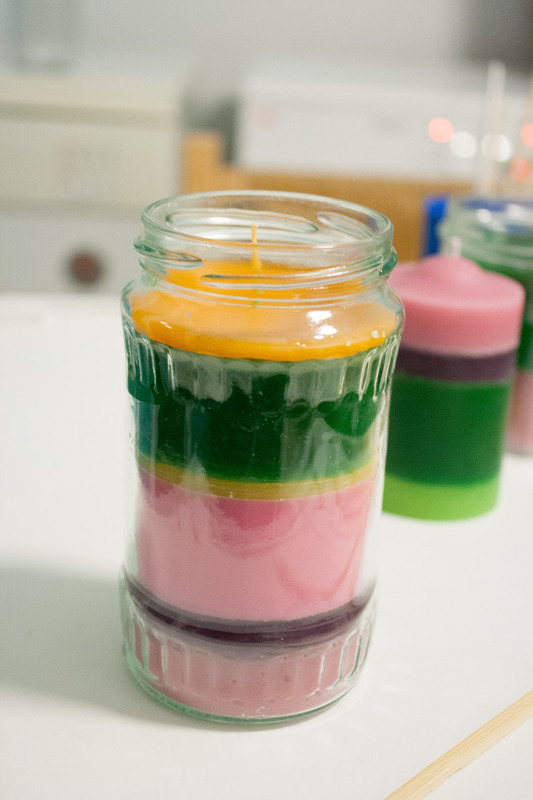 If you are making a multi-coloured candle, make sure to let each layer cool before pouring the next layer on top. Allow the wax to cool, about 1 or 2 hours. 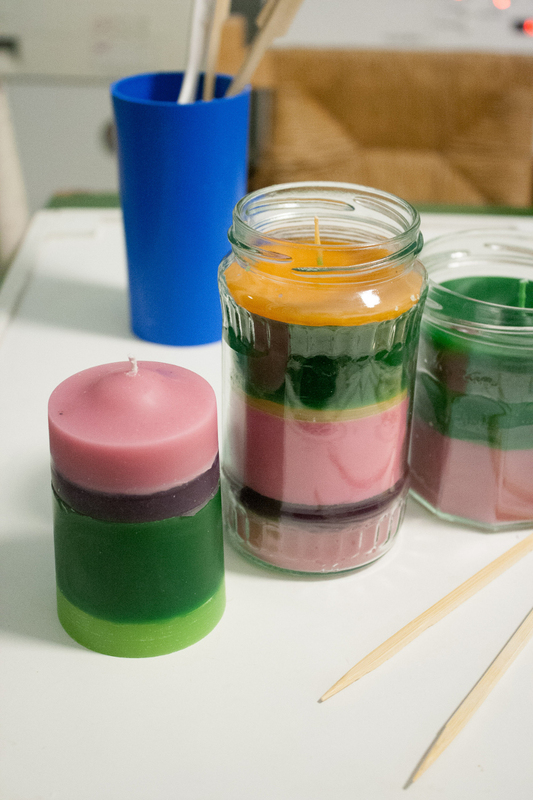 Most candle waxes require a re-pour after cooling. If you notice a dip near the wick once its cooled, heat up the remaining wax and top it off. Once your (re-poured) candle has completely cooled, trim the wicks. If you have used a mold to use your candles, place them in the freezer for a couple of minute to make removing them from the molds easier.